LAS VEGAS -- The MGM Grand Garden Arena was filled to capacity of 12,000 boxing fans more or less coming from all over America, the Philippines and all over the world to witness the official weigh-in of the two boxing titans, American boxing icon Floyd “Money” Mayweather, Jr. and Filipino boxing idol Manny “Pacman” Pacquaio. Added to the attendance was almost a thousand members of the media corps who filled up the ring floor and a part of the concourse section. Fans dole out $10.00 (or more) each to witness and see in person the two greatest boxers of this decade who will be fighting for the unified welterweight championships of the world and be part of one of the greatest sporting spectacles that will happen the next day, May 2nd. First in the history of boxing that any boxing event will charge the fans to see the boxers weigh-in for the fight. This has a two-sided purpose. First is for crowd control and the second is to benefit the two charities of choice by Mayweather and by Pacquiao. Half of the proceeds will go to the Susan G. Komen for the Cure foundation, a breast cancer charity Mayweather has supported through the years. The other half of the proceeds will go to the Cleveland Clinic Lou Ruvo Center for Brain Health, Pacquiao’s choice. The crowd in attendance exchanged boos and cheers when the host, Doug E. Fresh, asked the fans whom they are going to pick as the winner. A young boy of around 12 years old has chosen Mayweather to win in spite of the host showing him Pacquiao’s boxing highlights. That earned him funny boos from Pacquiao fans. American rapper Doug E. Fresh along with DJ Jay Bling and a TMT mascot were so busy hosting and keeping the fans entertained while waiting for the official weigh-in from past 12 until the arrival of the main protagonists at around 3:15 pm. The duo of Rey Sremmurd performed and Flow Rapper with their four dancers also performed. Around 40 boxers came up to the stage and were introduced by Doug E. Fresh. Most notably among them were Paulie Malignaggi, former IBF Light Welterweight and WBA Welterweight Champion; Lucian Bute, a former IBF super middleweight champion and Devon Alexander, a former WBC and IBF Light Welterweight champion and a former IBF Welterweight Champion. Pacquiao and his team entered first before the Mayweather team both to the crowd’s standing ovations with fans’ cell phones and cameras coming out like mushrooms as they headed to the stage and during the weigh-in. Michael Buffer of HBO and Jimmy Lennon, Jr. of Showtime, two of the greatest ring announcers of the modern era were on hand exchanging introduction of their boxers from the two undercards until the main event. Manny Pacquiao came in at 145 pounds and Floyd Mayweather came in at 146 pounds. Pacquiao said he is not bothered by the bigger size of Mayweather. “I have been fighting bigger guys like Margarito and others. Does not matter to me,” Pacquiao said matter of fact. The writer is also a contributor of Balita Filipino Newspaper based in California. 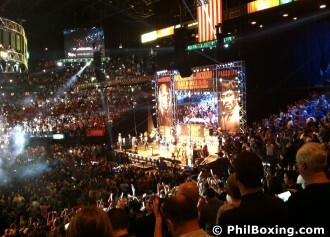 Photo: The huge crowd during the Mayweather-Pacquiao weighin at the Grand Garden Arena on Friday.